After falling short last season, the Nationals can consider their business with the Carolina League concluded after Wednesday night. Hector Silvestre gave up a run on five hits over six innings and the bullpen tossed three perfect innings as Class A Advanced Potomac defeated Myrtle Beach, 5-1, to win the Carolina League's Mills Cup. The Nationals got off to a quick start with Randolph Oduber slugging a three-run homer with two outs in the first inning. The early runs gave the club a mental boost, according to manager Tripp Keister. "It was huge," Keister said. "We really felt like we needed to take an early lead. Really, a three-run homer in the first inning is huge. Oduber got a 2-2 breaking ball and hit it good, and we just kind of went from there." Silvestre made that stand up, fanning six and walking one in the victory. After giving up a single to Royce Bolinger with two outs in the third, the 21-year-old left-hander cruised the rest of the way, retiring the final 10 batters he faced. "That was what we needed," Keister said. "Silvestre has been outstanding for us since coming up from Hagerstown. He pitched Game 1 of our division series and threw well. His emotions got the best of him early, pumping fastballs in there. When he started pitching in the third inning, he was pretty darn good." Manny Rodriguez followed with two perfect innings before giving way to Gilberto Mendez, who fanned two in a 1-2-3 ninth. "Manny has been through two Tommy John surgeries, it was great to see him be a part of the team," the third-year manager said. "It's really special, after what he's been through, to throw two innings. Mendez has been our end-of-the-game guy for the second half and he's been very good. It was great having him out there." Keister, who managed Class A Hagerstown last year, felt that the P-Nats came into the series with something to prove, since many of the players fell short of a South Atlantic League title with the Suns or the Mills Cup with Potomac last year. "I think a lot of us recognized where we came up short and didn't want to feel that way again," Keister said. "I felt like when we made the playoffs we had some unfinished business. I think everybody played with a chip on their shoulder and wanted to see this thing through." 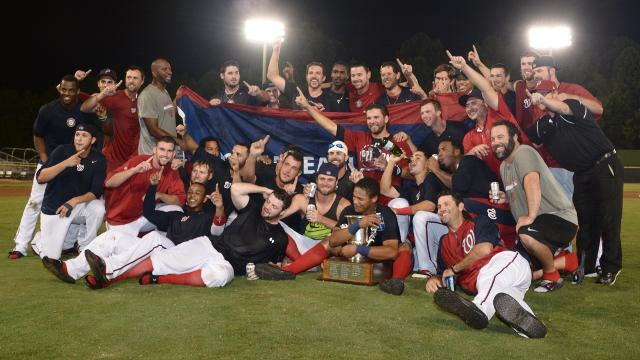 For the Nationals, this is their third Carolina League championship in seven seasons and the first since 2010. "It's great," Keister said. "I think there's a lot of relief. The long season and the culmination of that season, finishing off the series tonight at home in front of the fans, there was a big celebration." John Wooten, who homered twice in Tuesday's victory, was named the MVP of the series. The 23-year-old first baseman homered three times, plated seven runs and went 8-for-14 in the four games. "He really had a fantastic series," Keister said. "His three-run homer was the only run we scored in the first game we won. Two homers when we're down, 7-2, early to spring us to that victory last night. He put us on his back those two games and allowed us to be in the situation we are right now." Michael De Leon plated the Pelicans' lone run of the game and finished with six RBIs in the playoffs.